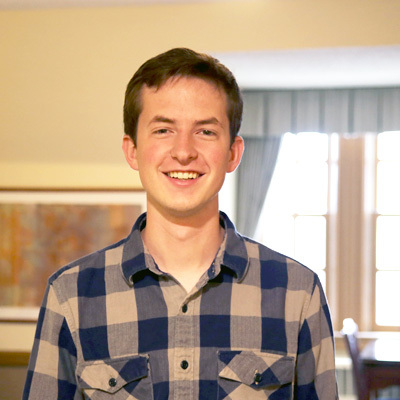 Paul Burns, a senior aerospace and mechanical engineering major, works as a student manager at the Inn at the Michigan League. In addition to his academics and job, Paul is involved in the M-Fly student organization and serves as the chairperson for the Michigan League Board of Governors. How did you discover your job at the League and what interested you about it? As my first semester was coming to an end, I began looking for an employer that would take my needs as a student into account. I came across the hotel position on the Student Employment website. I had stayed at the Inn before, and had visited the League a number of times when I was younger, so applying was an easy decision. What are the benefits you have seen from your job? Meeting people from all walks of life who travel to the University of Michigan from across the globe is perhaps the greatest benefit of the job. I've also developed skills that I would not have gained through school alone. Customer service, performing under pressure, and juggling school and work with several other extracurricular activities are just a few of those skills. I've also met some incredible student and full time employees, who are always willing to share their experiences and plans for their future. How do you balance your work and student organization activities with your engineering major? It's a challenge, but it has taught me to carefully manage and organize my time. I think that being so busy has forced me to prioritize the truly important meetings and moments throughout my time at Michigan, and I'm grateful for that. What skills has your time with the League Board of Governors provided that you will take with you? The Board of Governors has been an incredible experience unlike any other on campus. There are few things more inspiring than meeting a group so passionate about an organization and its history as the members I've met on the board. It has taught me to understand and cherish the past while embracing the future. Additionally, as a part of the board, I had the opportunity to interview candidates for a couple director level positions within University Unions, something I would not have gotten elsewhere. I was also given the opportunity to lead the board, which has been an experience truly second to none. I am confident that I will carry these skills with me after college. Students can browse for jobs on the Student Life jobs website. In addition, there are approximately 20 volunteer advisory boards within Student Life that cover a variety of topics.